Graphtec FC4500 Series come standard with a dual head configuration allowing pens, cutting tools, and creasing tools to be loaded simultaneously. A new reverse creasing function allows alignment and creasing on the reverse side of the printed card stock to prevent traces of the creasing operation from appearing on the printed surface. A simple function to create fold lines for clean folding on micro-flute and cardboard has been enabled. Up to three fold lines can be selected. If two or three fold lines have been selected, the spacing between the lines can also be specified. Repeated creasing operations can also be specified for each of the lines. Cutting and creasing can be carried out from reverse-side when using the registration marks. This prevents crease line from appearing on the printed surface. Graphtec FC4500 Series are perfect for designers and prototyping in the offset printing, digital printing, packaging industry, fashion industry, as well as road sign making, stone & glass sandblasting/etching, the electronic film industry, and architectural model building. FC4500 Series are intermediate-format, professional flatbed cutting plotters capable of processing a wide variety of materials with accuracy — compliant to most industry requirements for pattern making. The series includes two table top models, the FC4550-50 and the FC4510-60. An optional stand is available for the FC4510-60. Equipped with the ARMS (Automatic Registration Mark Sensing system). Enables higher productivity of POP, stickers and prototype cartons. Precise control of contour cut, half cut, perforated cut, and plotting. Ideal for creating samples or small production runs. 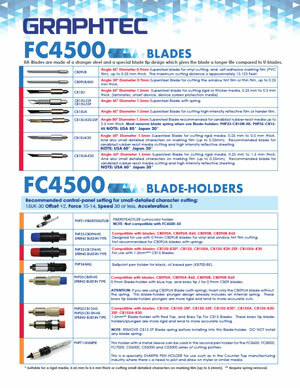 FC4500 Series comes with 2 Year Standard Warranty. Includes: D-Cut Master software (Windows), Graphtec Pro Studio software & Cutting Master 4 plug-in for Illustrator & CorelDraw (Macintosh & Windows compatible). * 1 For Macintosh, It needs to be used the Cutting Master 4 that is plug-in software for Illustrator. Both models are equipped with two Tool Holders for cutting, creasing and plotting. For graphic design and packaging mock ups, the FC4510-60 has the dual Tool Holder which can hold a cutting blade and creasing tool — to produce creases/folds and cuts on the same run. With their capability to hold both a cutting blade and a plotting pen simultaneously, the FC4500 Series allows garment and shoe pattern designers to mark and cut the material without manually replacing the marking and cutting tools. Flatbed cutting plotter is used for not only sign making but also for a wide range of industrial applicaitons and processes. Max.750mm/s cutting speed is useful for getting high productivity. FC4500 Series are professional flatbed cutting plotters capable of processing a wide variety of materials with accuracy. Compact size that can be set on a table with precise control of contour cut, half cut, perforated cut, and plotting.this FC4500 Series is the most economical solution for cutting thick, hard materials that cannot be fed through a grit rolling type cutting plotter. The media is held by the dot shaped adhesive material on the low tack cling mat. Low tack cling mat size: 17.126 in x 24.0157 in, thickness 0.4 mm. It is suitable for plastic film based media. The media to be cut is held to the cutter by the micro-sucker on the cling mat. Micro suction cling mat size: 17.126 in x 24.0157 in, thickness 0.8 mm. It is suitable for paper based media. The media to be cut is held to the cutter by the sticky soft plastic mat. Adhesive mat (soft mat for making the creasing) size: 17.126 in x 24.0157 in, thickness 1 mm. It is suitable for cardboard. The media to be cut is held to the cutter by the pressure-sensitive adhesive on the adhesive sheet. Adhesive sheet (double-sided adhesive coated sheet) size: 21.45 in x 65.6 ft. It is suitable for harder media that needs higher cutting forces. * Supplying in roll. It is used by cutting to the required size. Assessment varies by the material. There is different characteristic materials in the same category. Please evaluate with the material that is actually used. *1. Adhesive force will be weakened by the paper dregs in not many cuts. The mat needs to be frequently replaced. Do not recommend for this material. *2. It may occur curling of the material by strong stickiness when it is peeled off from mat. *1. The CB15U or CB15U-K30 cutter blade is used. *2. The CB15U-K30 or CB15U-K20 cutter blade is used. *3. The CB15UA cutter blade is used. *4. HP-GL™ is registered trademark of the Hewlett-Packard Corporation of the United States. *5. When operated with Graphtec specified media and conditions. *7. The stand is not included. *9. The software can be used by downloading from Graphtec website. Pen holder PHP34-BALL Pen holder for KB700 Pen.